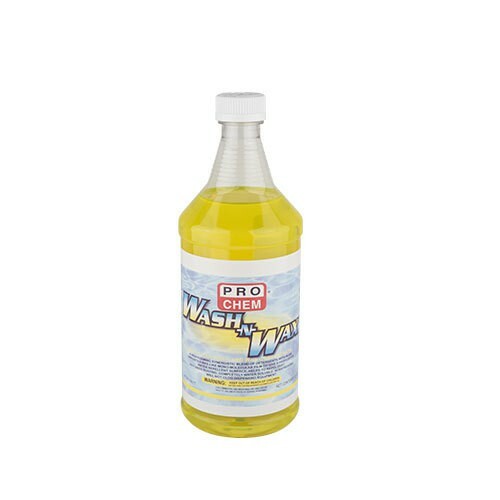 Wash-N-Wax | Pro Chem, Inc.
WASH-N-WAX is a high foaming blend of detergents and a proprietary additive, W-300, which imparts a monomolecular film to give a high luster. It helps to repel dust and retard rust. This product is nonstreaking and will not harm the metals, coatings, rubber and glass used in vehicles of all types. It deposits a wax-like film that causes vehicles to dry faster, thus making the job easier while cutting costly labor time. For Car Wash Machines: WASH-N-WAX can be used in car washing machines by following the dispensing instructions recommended by the machine manufacturer. For Hand Washing: Remove loose dirt, dust and grime by prerinsing car. Use a solution of 3 ounces concentrate to one gallon of water. Wash with cloth or brush. Excessively soiled areas may have to be rubbed until clean. Rinse thoroughly with clean water. Do not let solution dry on car. Do not use in direct sunlight. Rinse immediately after washing.